The Raving Queen: Oh, My God, Darlings!!!!!!!!!!!!!!!!!!! You Have GOT To Go!!!!!!!!!!!!!!!!!!!!!!!!!! Oh, My God, Darlings!!!!!!!!!!!!!!!!!!! You Have GOT To Go!!!!!!!!!!!!!!!!!!!!!!!!!! Girls, this is just in, because I only found out about this, yesterday! And you bet I am not going to waste any time, informing all of you!!!!!!!!!!!!!!! For awhile now, the Film Forum, over on Houston Street, has been having these screenings they call "Film Forum, Jr.," where they show child-centric films, (one of their earliest offerings, which I missed, but so wanted to see, was "The 5,000 Fingers Of Dr. T!!!!!!!!!!") and which are often better than the so-called adult fare they regularly offer. And some of the films are genuine classics. I mean, two weeks from Sunday, on the 30th, they are going to show "Forbidden Planet," MGM's 1956 sci-fi reworking of Shakespeare's "The Tempest," with Walter Pidgeon, as Dr. Edward Morbius (Prospero), a pre-Honey West and Georgia James Anne Francis, as his daughter Altaira (Miranda), and Robby The Robot (Ariel, the friendly sprite!). I am telling you, with Anne Francis, gang way, kids, forget about getting in, or get there early, because, I am telling you, every queen in the tri-state area that can get down there, and in, will go to this! When "Funny Girl" is shown, Anne's name, from queens, gets as much applause, as You Know Who!!!!!!!!! So, with this film, they will go certifiably Anne Crazy!!!!!!!!!!!!!! However, the film I am urging you all to go to is what is being shown this Sunday, no doubt because of Father's Day--the 1945 film version of "A Tree Grows In Brooklyn." Let's start with the novel. If you have not read it, DO! Francie Nolan and her family will occupy a place in your hearts for the remainder of your days. Betty Smith's novel goes beyond the Nolans in 1912 Brooklyn, to cut through to something in the human soul!!!!!!!!!!!!!!! Then there is the film. The fist directed by Elia Kazan--and what a debut! 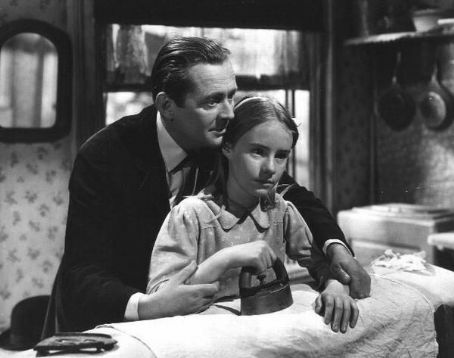 The film which won, for Peggy Ann Garner, indelible as Francie, a special Juvenile Oscar, for "An Outstanding Performance By A Child Actress." Peggy's mother, by the way, was pissed when Twentieth Century- Fox passed on the screen rights to "National Velvet," which went over to MGM, and Elizabeth Taylor. Studio head Darryl Zanuck assured Mrs. Garner they were buying an even better property for her daughter--and I am not sure he was wrong, even though I love "National Velvet!" Then there is Dorothy McGuire, as Katie, who is a revelation, and if any of you ever thought she was not much of an actress, but just another pretty face, take a look at her, in this!!!!!!!!!!!!!!!!!!!!! And lastly, James Dunn, as lovable, alcoholic loser Johnny Nolan, in the performance that won him the Supporting Actor Oscar. Not to mention Joan Blondell, showing her acting chops, as Aunt Sissy. father saved money, and paid for, long before he died!!!!!!! I defy anyone to keep a dry eye during this moment!!!!!!!!!!!!! Excuse me, dolls, I have to wipe my eyes, with a hankie!!!!!!!!!!!!!! This is a true film classic, and while I have seen it, I have never done so, on the screen! Would I love to be there, with you all!!!!!!!!! If you have never seen it, I can think of no better opportunity than the one before you, this Sunday, at the Film Forum!!!!!!!!!!!!!!!!!!! For everyone, with love in their hearts, darlings!!!!!!!!!!!!!!!!!!!!!!!!!!!! !